Now that it’s spring we Canadians are starting to think about warmer weather and spending more time outside. 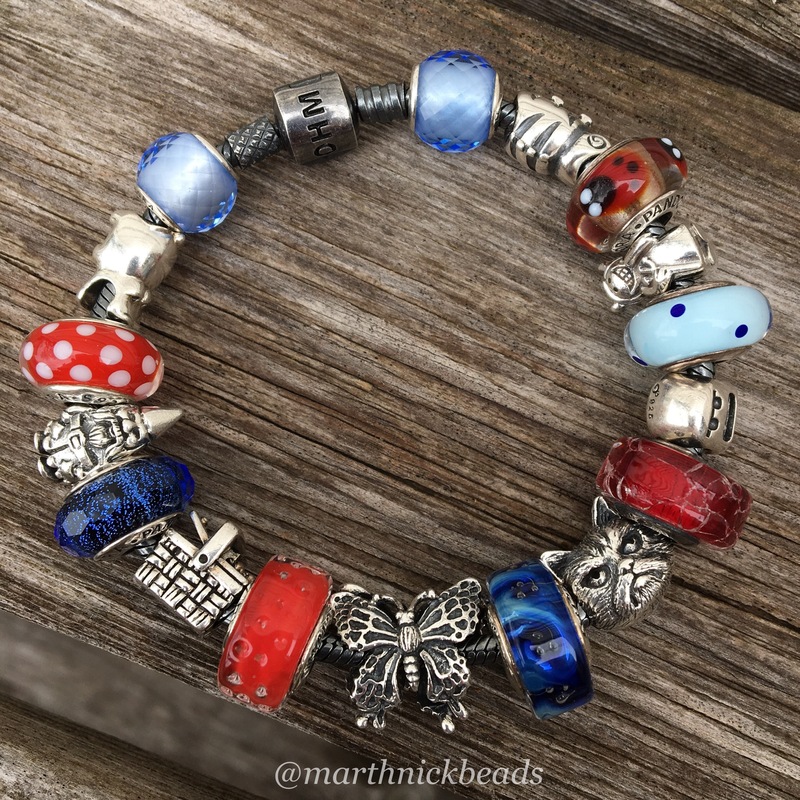 The Ohm Beads Strawberry bead is particularly perfect and the Butterflies and Picnic Basket are going to be so wonderful for the summertime. Let’s start with the glass Strawberry bead, as glass is what got me starting to collect Ohm Beads in the first place. It’s a Limited Edition and retails for $35 USD/ $45 CAN. I love how it’s a true red and wanted to see how it fits in with some of my other beads. First, with some old Pandora, I’d say the Strawberry bead fits in perfectly! It doesn’t match the red Ohm Beads Broken Heart perfectly but I think they look good together, especially with the Cold Milk and Waterfall beads between them. For a strawberries with ice cream and chocolate sauce vibe I added in the Bolly Wood beads. 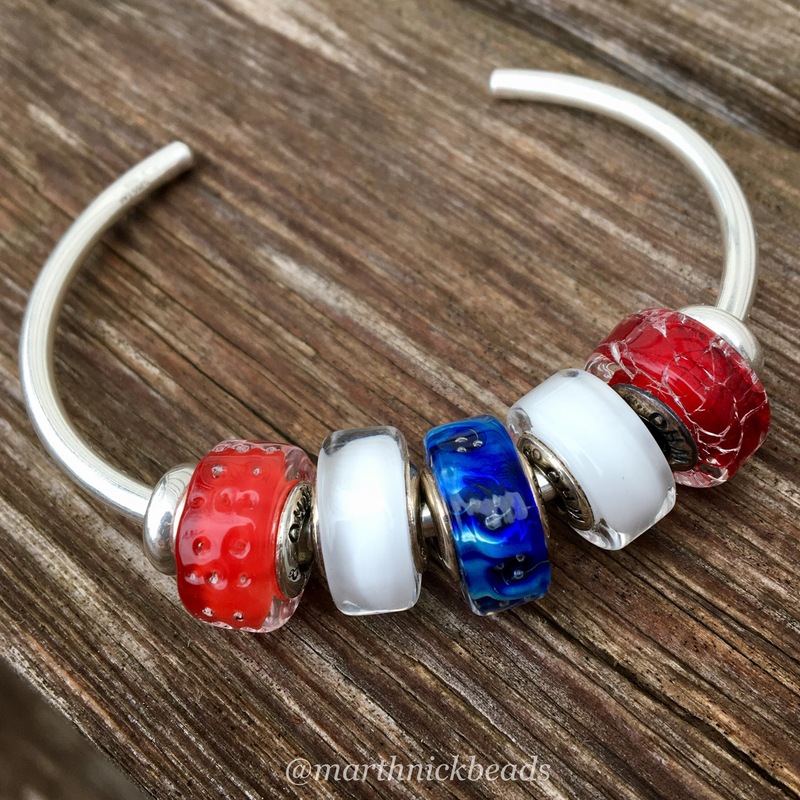 Here’s a simple red and blue bangle. So, I think it’s safe to say that the Strawberry bead fits in with a wide variety of other beads, which I always love! And the Waterfall bead really looks stunning here. 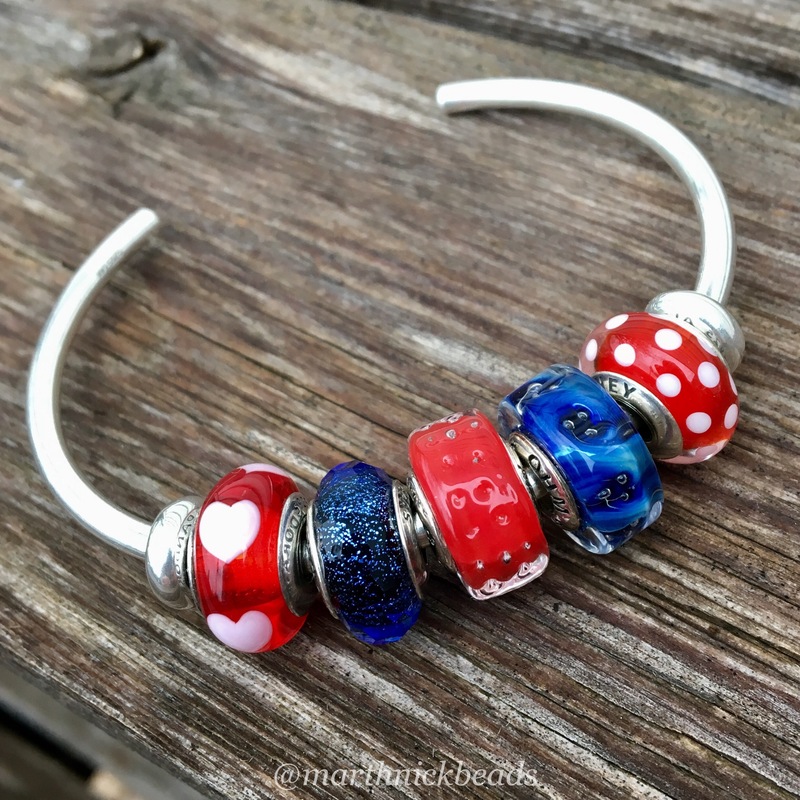 It’s so hard to not want glass beads in pairs! 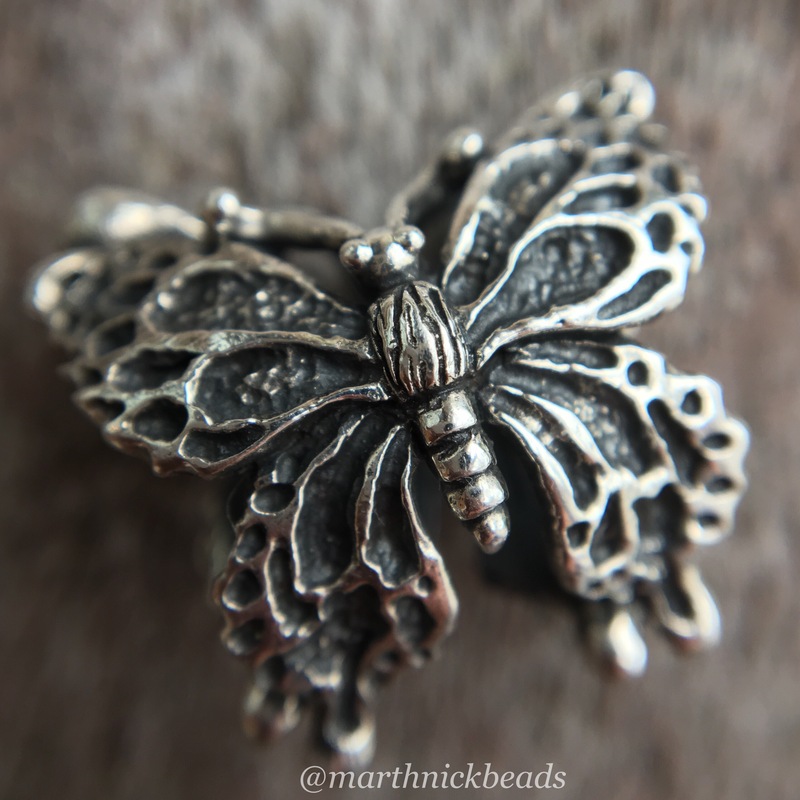 Next is the beautifully detailed Butterflies silver bead, which costs $55 USD/ $70 CAN. It is actually two butterflies joined together. There is quite a bit of space between them. You can put it on a bracelet or it sits well on a necklace like this. My husband asked me why there was a butterfly on an asteroid. 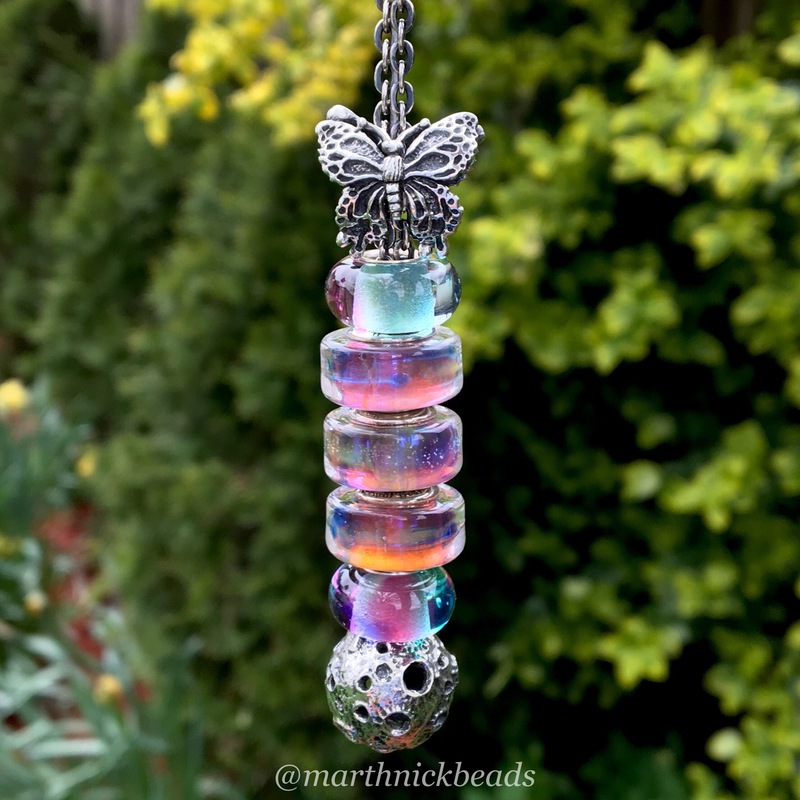 I liked the @ohmbeads description better…and I quote, “Unicorn on the moon becomes a butterfly! Because the asteroid is really a unicorn turd. And it fertilized life as we know it. ” LOL!!!! I had it on my Insta Story and that’s how this description came about. 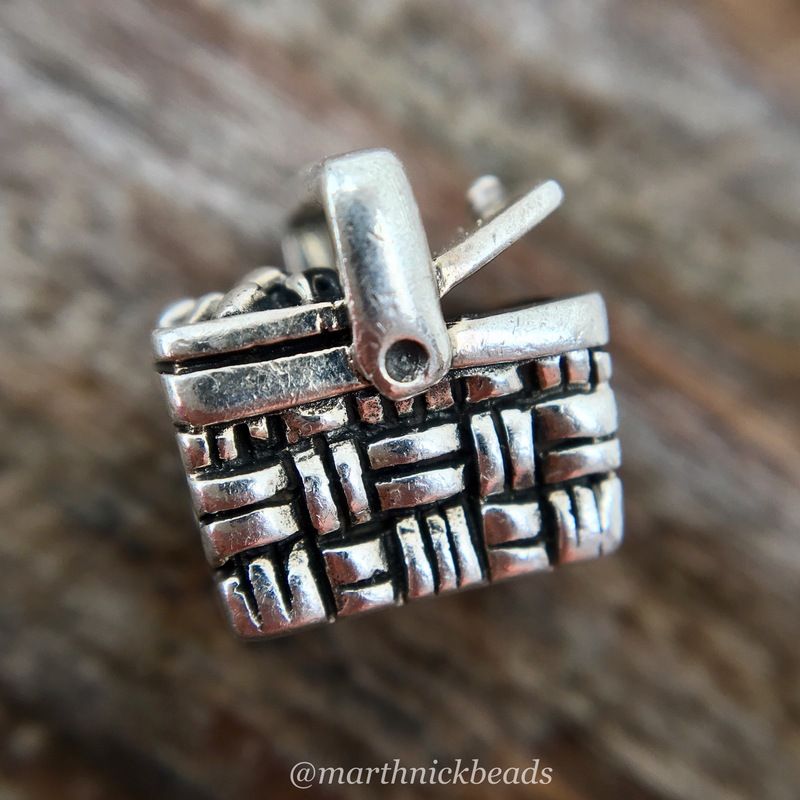 Finally, the Ohm Beads Picnic Basket, costing $30 USD/ $40 CAN is an absolutely adorable silver bead. I love how the lid is up on one end. 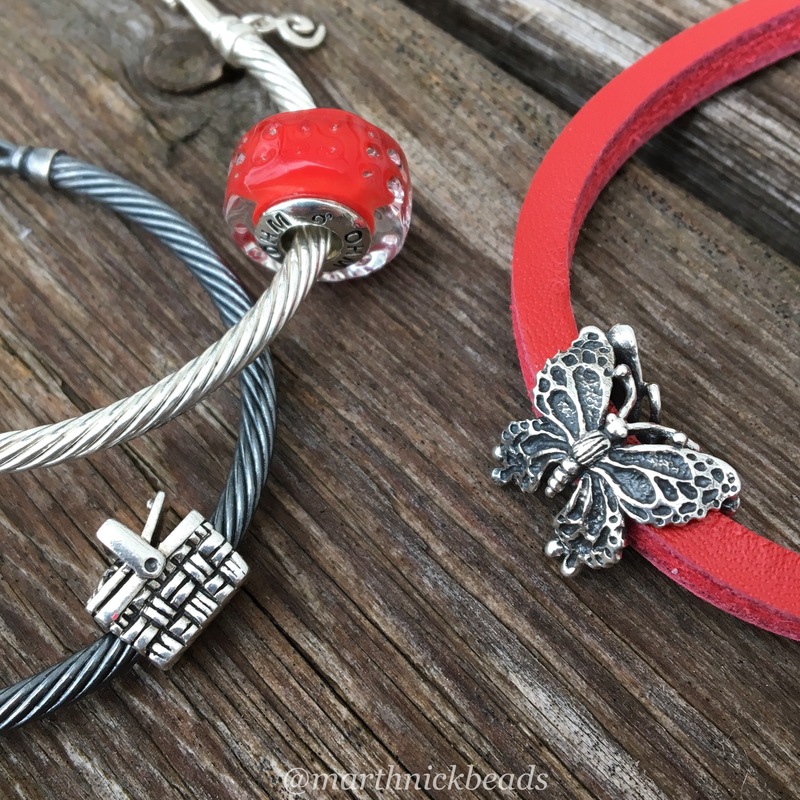 In the combos below, the Butterflies bead perfectly fits on a Trollbeads Unique Leather Bracelet. 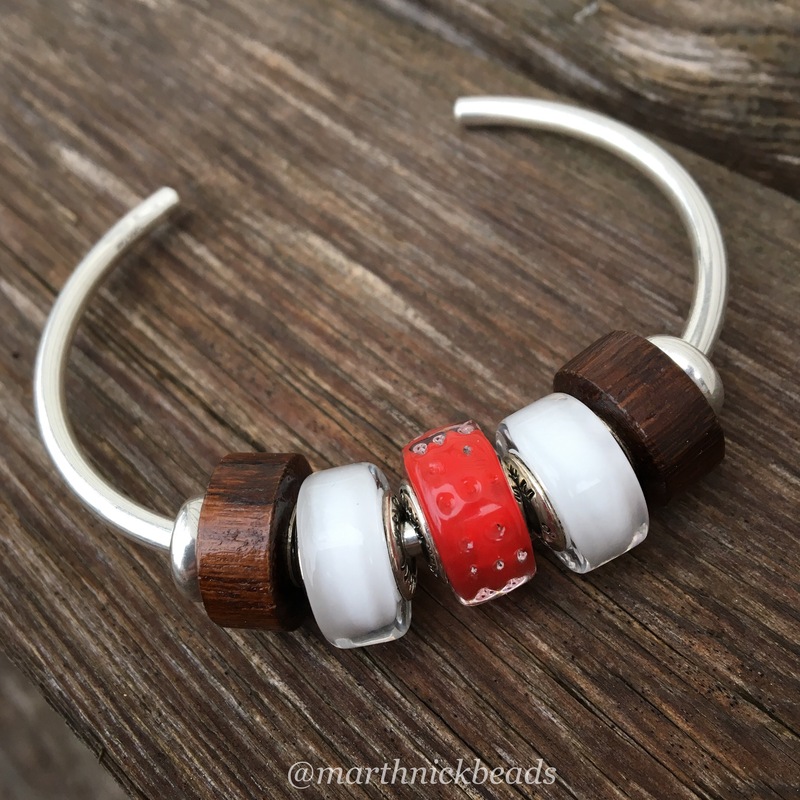 The red matches the Strawberry bead and the Picnic Basket really pops on the Dirty Twisted Bangle. I made up a big bracelet with a few friends from the Ohm Beads gang. I really like how the blues and reds look on the Dirty Bracelet! Grumpy Cat is never happy, wherever he is, but whatever! I’m going to make a lot of use out of theses beads in the summer. I’m also very happy to have a new red glass bead, as they are not that common and this is such a happy shade of red. Is anyone tempted to get any of these beads for the summer season? I want a pair of the Strawberry bead (as I always get pairs of glass beads, otherwise it drives me crazy) and the Butterfly. The wish list never ends! The Picnic Basket is a nice low price, at least. These beads are really getting me in the mood for summer but this morning it’s only 2C out! This is such a happy, hopeful post. As the sun has returned and buds on the trees are bursting open after all the rain, I love the thought that summer is so close. We love to go strawberry picking at a farm nearby, and picnicking at the beach, so these are two of my fondest summer outings. OHM has a way of coming out with totally original and evocative beads. You always make them look so desirable. I think you have combined them beautifully with all the brands and have created some lovely summer bracelets. Thanks Sarah! I so agree about strawberries and the summertime. Everything is growing so fast after all that rain and I just want to go to a garden store and start planting some pots, but it’s still too chilly at night for that. 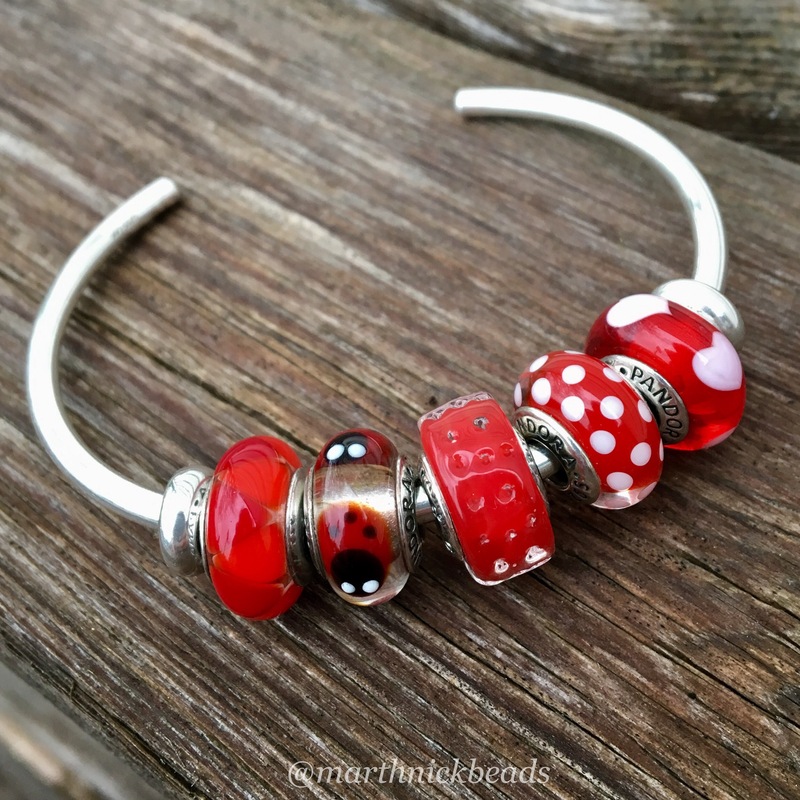 I’m also thinking that the red glass Strawberry bead just by itself will be lovely on a really hot day. Enjoy your day off! I agree with Alexandra R., I hadn’t noticed the picnic basket, it is very cute and I think the recent releases of the strawberry glass, mason jar and picnic basket are really coherent and clever. As of now though, these guys are not at the top of my Ohm list, as the Italian release has captured that spot. 😉🌋 Letting my bead budget muscles take a well-deserved rest! Hi Tanya! The Picnic Basket isn’t new, but I though it paired really well with the Strawberry and Butterflies beads. And I totally forgot about the mason jar! I have it in a different box from my other Ohm things, so shall rectify that situation today! 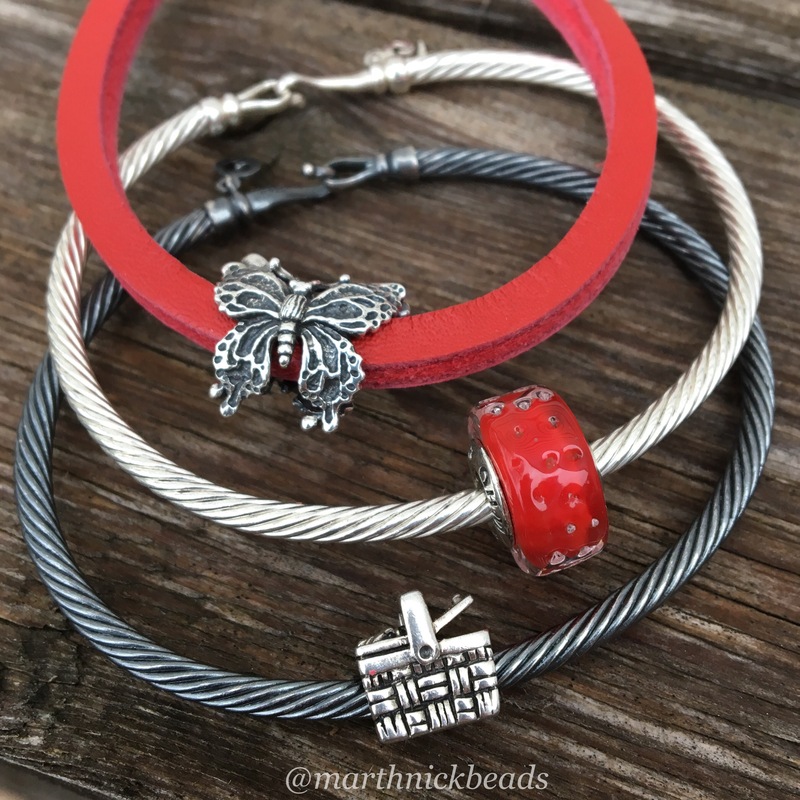 I really like your combination with the Strawberry bead and Picnic Basket on the twisted bangles and the Butterfly on the leather bracelet. Sadly, I have NO money left now for beads. I hear you, Suzanne! I’m glad you enjoyed seeing them, anyway! I can’t believe that my two packages from Perlen are here in the U.S. already. I placed one order on the 3rd and then the other on the 4th. That seems really fast to me. I’m not complaining, mind you! What a fun post. I must agree with everyone the picnic basket went unnoticed and is beyond adorable. Is there any bread or fruit coming out the top, the non lid side looks bumpy. I love how this strawberry glass seems to blend so nicely with so many beads in your collection — what a perfect match to the new TB leather ( how clever to pair them up 😀) I have to say the bracelet I am soo obsessed with and can’t stop viewing is the one where strawberry in the masked waterfall next to it and the two Pandora ( dots and Hearts on the end ) this is a statement bracelet and is soooo pretty ! Hi Alex! The Picnic Basket is an older bead but so perfect for the upcoming summer season and I thought people might be interested to know about it. There are some tiny grapes on the top-so cute! I’ll have to look for some grape coloured beads to pair with it at some point. I also love the bangle you’re talking about. The reds and blues are so pretty together! Your combinations are wonderful! They make me want to go on a picnic! Thanks April! Picnic weather shall be coming up soon!